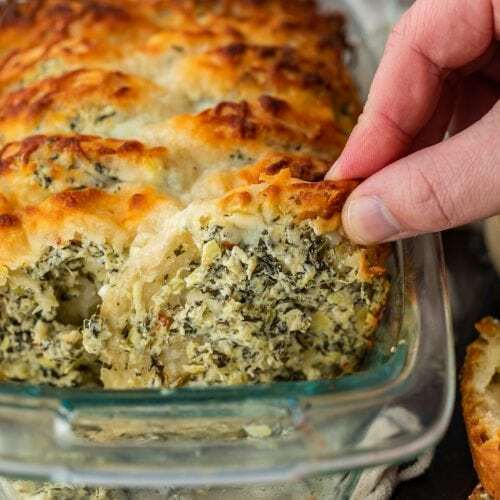 Spinach Artichoke Dip Pull Apart Bread is the perfect way to get that delicious spinach artichoke flavor in the form of an easy bread. Make it as an appetizer or a tasty side dish to serve with your favorite dinners. This pull apart bread recipe is super simple and super flavorful! 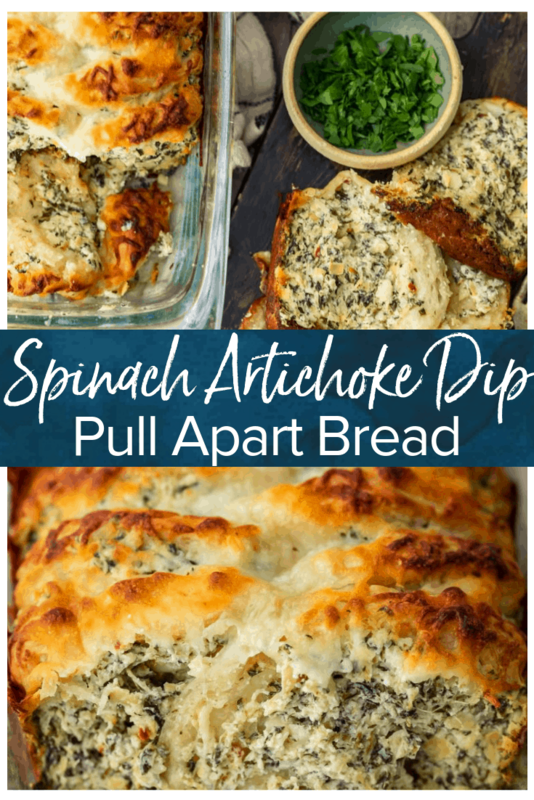 Combine spinach artichoke dip and easy pull apart bread, and you’ve got one tasty recipe! This bread is so delicious and so easy to make! Everyone loves spinach artichoke dip. 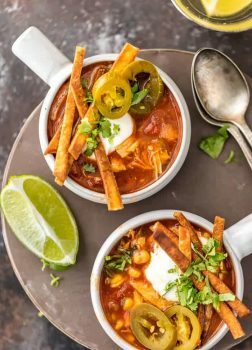 It’s super creamy, cheesy, and full of flavor! I could dip my chips right in and absolutely devour an entire bowl of it. Now imagine that tasty appetizer mixed with bread. There is no need for dipping, because every bite of bread is filled with spinach artichoke goodness! This pull apart bread recipe is made using pre-made biscuit dough, so it’s really easy to make. The bread has that flaky, buttery texture we all love. Plus it’s topped with cheese and a special parsley butter. Yum! 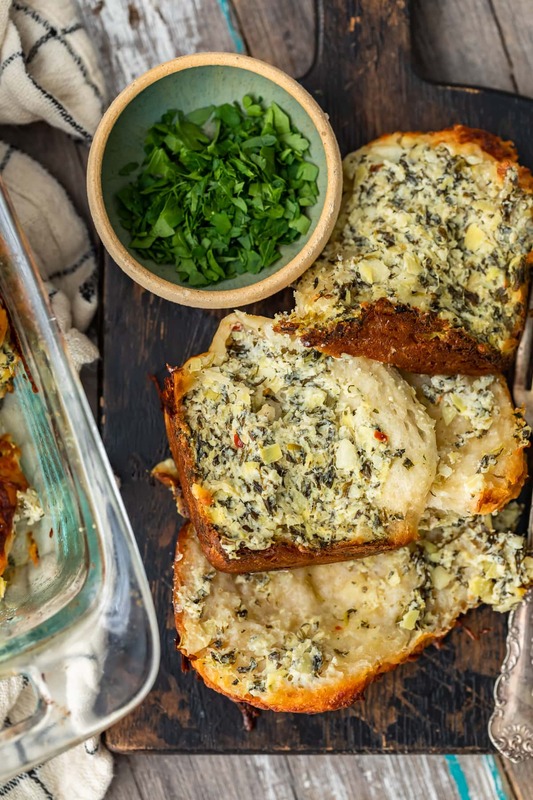 Bite into a piece of spinach artichoke bread and you’ll be in heaven. 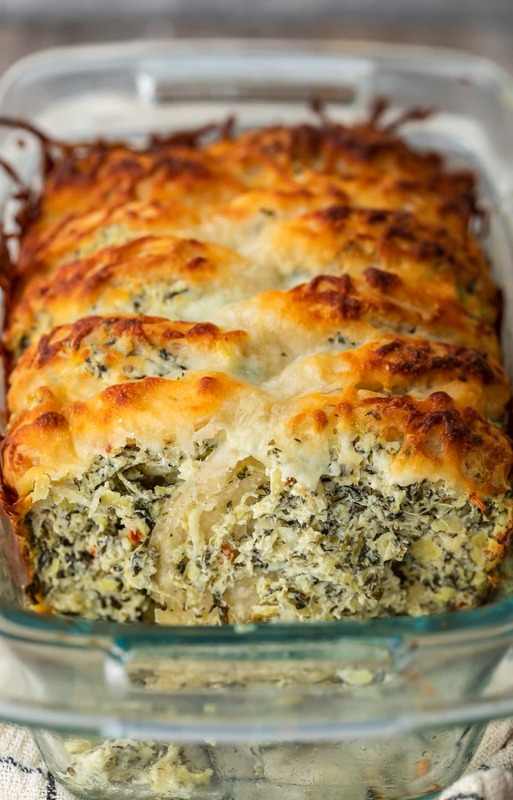 This spinach bread makes an amazing side dish for any dinner. It goes great with chicken, but I’d eat it with anything. This spinach pull apart bread also makes an easy appetizer, something delicious to serve before the meal! 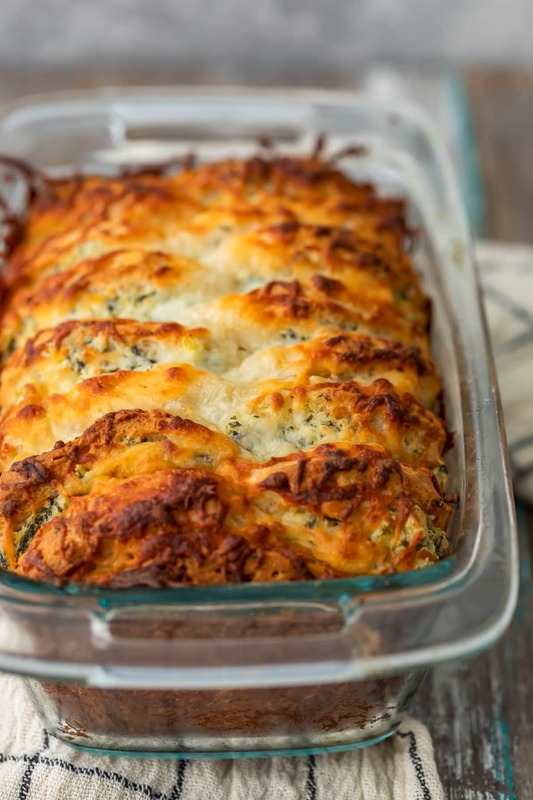 Everyone will love this Spinach Artichoke Dip Pull Apart Bread recipe. Cheesy, creamy, crispy, and so easy to make! Pull apart breads are so much fun. They’re so easy to make, and so easy to share. Everyone can just grab a piece and eat. Our Pull Apart Bread with Bean and Cheese Dip is always a favorite appetizer, and our Savory Pull Apart Monkey Bread is another delicious option. 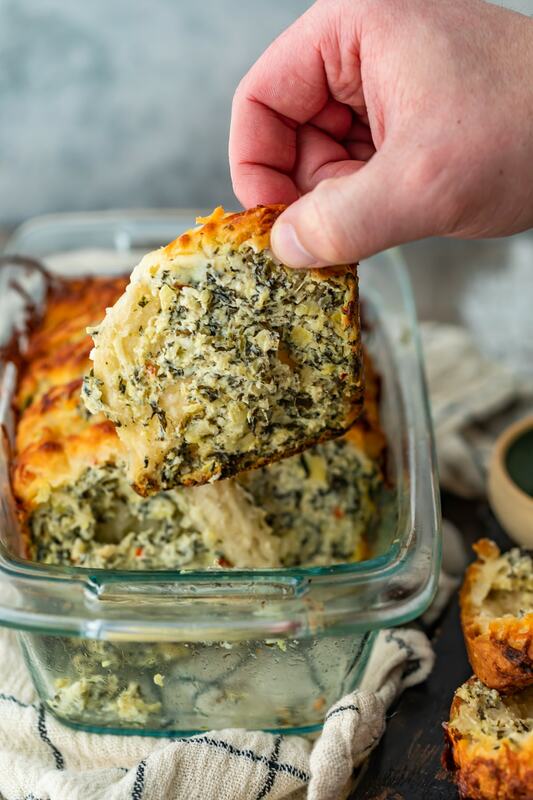 This Spinach Artichoke Dip Bread is right up there with the favorites because it combines two delicious things: DIP and BREAD. So you’ve got it all in just one simple bite. With that extra cheese baked on top, it’s just unbelievably tasty! It seems to me that Spinach Artichoke Dip is something that EVERYONE loves. I mean, how could you not? Cream cheese, spinach, artichokes, more cheese…it’s the perfect dip and it’s full of flavor. Bread always makes a great dipper for spinach artichoke, so combining the two is kind of genius. If you just want the dip, try our Skinny Parmesan Spinach Dip, or our Vegan Spinach Artichoke Dip. 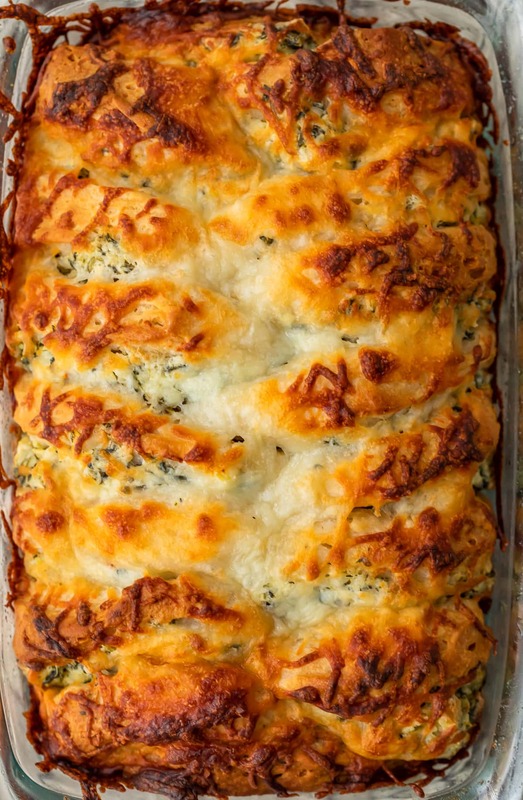 This Spinach Artichoke Dip Pull Apart Bread recipe is filled with some of my favorite things. I love how easy it is to make a loaf of bread filled with dip! We’re using pre-made biscuit dough, and I love the texture and flavor the dough adds to this recipe. Prepare the spinach and artichokes according to the instructions in the recipe card (they both need to be mostly dry before combining with the other ingredients). In a large mixing bowl, combine spinach, artichokes, cream cheese, Mozzarella, Parmesan, garlic, lemon juice, mayonnaise, red pepper flakes, salt and pepper. Stir everything together really well. Cut each pre-made biscuit completely in half. Spread 2 tablespoons of the spinach artichoke dip mix onto each biscuit, and place them in the bottom of the loaf pan. Then place the other half of the biscuit on top of the dip. Cover the loaf pan with aluminum foil, and bake for 45 minutes at 350°F. Mix together melted butter and parsley. After 45 minutes, remove the foil from the pan, brush the top of the bread with the parsley butter, the sprinkle the rest of the mozzarella cheese over top. Let the bread cool in pan for 10 minutes before serving. Hot, crispy, cheesy, and creamy. 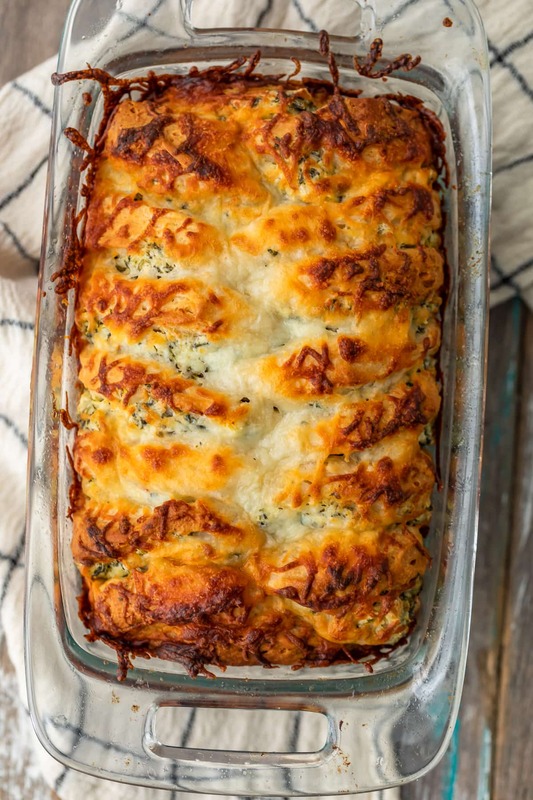 This spinach artichoke dip pull apart bread is just sooooo good! Be sure to check the recipe card for more detailed instructions. There’s nothing better than an easy bread recipe…except an easy dip recipe. 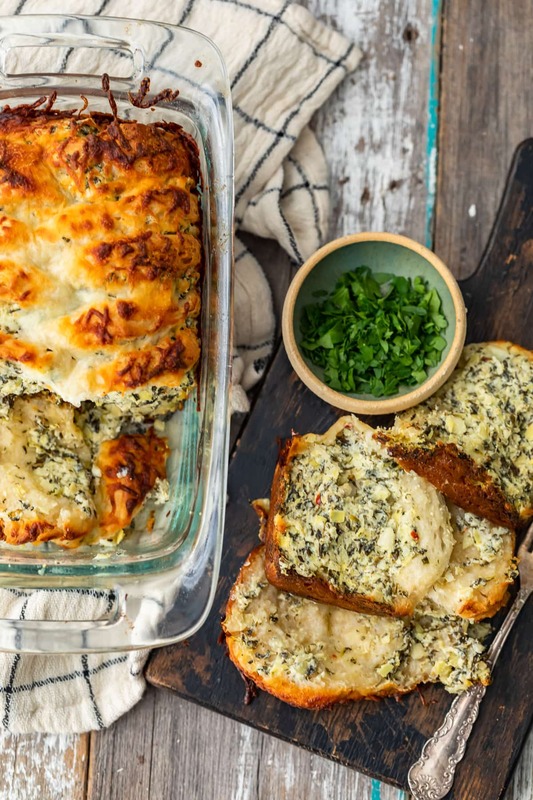 Luckily, this spinach artichoke pull apart bread is both! A bread and a dip all in one, ready to eat. This is such a great side dish, but works just as well as an easy appetizer recipe. You’re going to want to serve it ALL the time, so don’t limit the possibilities. Serve it with dinner, serve it before dinner, serve it on game day, Valentine’s Day, any day…just make sure you try this delicious dish! 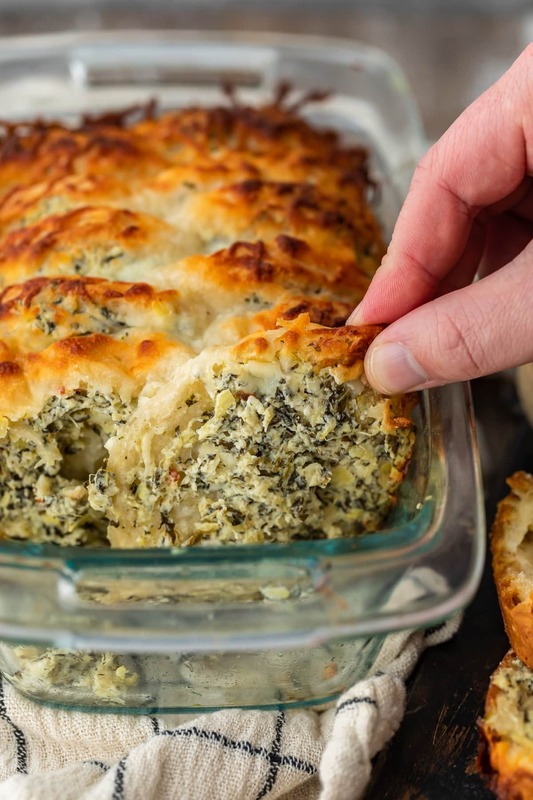 This Spinach Artichoke Dip Pull Apart Bread recipe is the best of both worlds. A flaky bread and creamy dip all in one. I hope you love it as much as I do! See the recipe card below for details on how to make Spinach Artichoke Dip Pull Apart Bread. Enjoy! Heat oven to 350°F and spray a 9x5-inch loaf pan with nonstick cooking spray. Wrap the thawed spinach in several layers of paper towels and squeeze firmly (over a large bowl or the sink) to remove the excess moisture. Pat the drained artichokes with a paper towel to remove excess moisture. The spinach and artichokes should be fairly dry before adding to the remaining ingredients. In a large bowl, combine the squeezed-dried spinach, chopped artichokes, cream cheese, ½ cup mozzarella, Parmesan, garlic, lemon juice, mayonnaise, red pepper flakes, salt and black pepper. Mix well. Cut each biscuit in half horizontally through the entire biscuit. This will double the total number of biscuits. Spread 2 tablespoons spinach/artichoke mixture over one side of each halved biscuit. Place the biscuits (standing up) in the loaf pan so a layer of dip is between each biscuit. Leave both ends of the loaf bare of dip. Cover the pan with aluminum foil and bake at 350°F for 45 minutes. While the bread bakes, mix together the melted butter and chopped parsley. After 45 minutes, remove the foil from the loaf and brush the top with the parsley butter. Sprinkle the bread with the remaining ¼ cup mozzarella cheese and bake another 15 minutes or until the loaf is golden. Transfer to a cooling rack and let the bread cool 10 minutes in the pan. Remove the bread from the pan and serve immediately. This is the kind of bread my dreams are made of! This looks like heaven on earth! Cheese, spinach, bread =heaven! 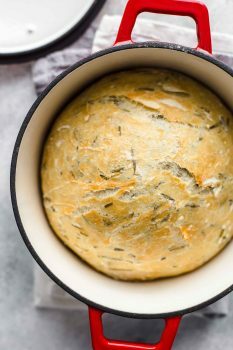 I love spinach artichoke dip and can’t wait to try this bread recipe. It looks amazing! This is so genius to make it all together. Now I don’t need to worry about enough chips or enough dip because it’s all in one. Win! 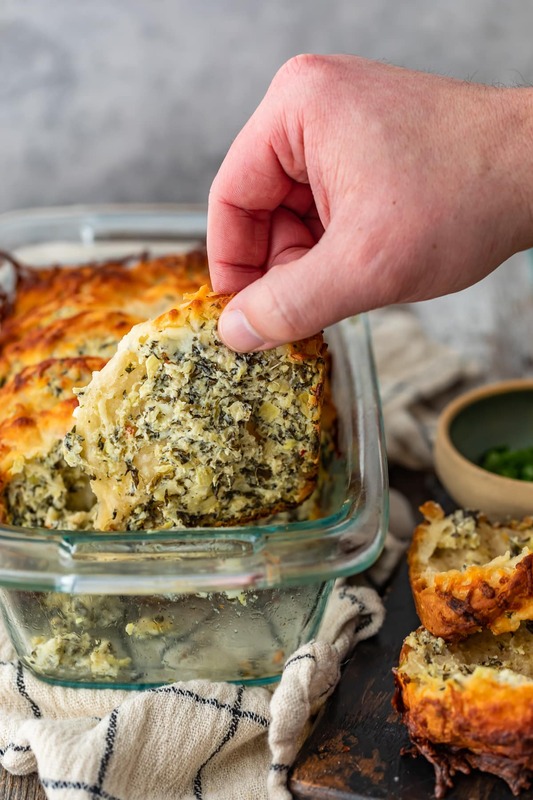 We love spinach artichoke dip, so I know this bread will be a hit in our house!! Can’t wait for you to try it! I hope you love it!